Explore what better speech can do for you and your business. Are you concerned with your pronunciation? Let our accent reduction and business communication skills training help you to pronounce, present and project with greater confidence. Do you mumble, speak quickly and even forget what you want to say when asked to present in front of others? With our public speaking and presentation skill training you will gain the confidence to present in front of groups of any size. Do you have trouble speaking in a concise manner? We will provide strategies to improve your delivery of spoken information whether you are practicing public speaking or improving your business communication skills. Are you a young adult looking to move forward in your career? Our experienced staff has helped many like you land their dream job or promotion by working on presentation skills, interview skills or business communication skills. Watch Jayne Latz, CEO of Corporate Speech Solutions, on the Today show, share a valuable training tip below. Our goal at Corporate Speech Solutions is to provide you with the communication skills that will impact and influence others. Watch Jayne Latz share her story of how she became a communication pro. Become the best public speaker you can be! Do you need to improve your diction? Reduce your accent? Project your voice strategically on the telephone and in the conference room? It’s all possible with the right voice or accent reduction training. With our accent reduction training expertise and tools, our clients have gone on to speak at the White House, earn dream jobs, and address hundreds and thousands of people with clarity and confidence. Corporate Speech Solutions goal is to advance your career by helping you communicate more clearly and effectively. Achieving amazing accent reduction and voice training results since 2006. Are you ready? Build your clarity and your confidence. Learn to transform your communication skills! Learn to communicate in a clear, concise and confident manner. 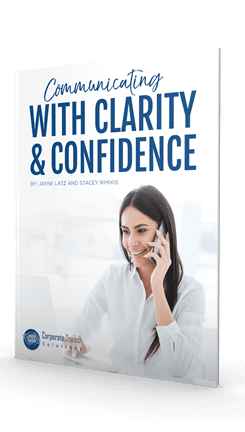 Simply enter your email below and receive your FREE copy of, "Communicate with Clarity and Confidence!" Join the thousands in our newsletter community and receive monthly information about our special events, promotions and of course, great communication tips!